This article was published in the Spring 2013 Baseball Research Journal. Babe Ruth was one of the most iconic players in baseball, and Runs Batted In are one of the most revered statistics in baseball. Not surprisingly, Ruth was one of the most prominent RBI men in the history of Major League Baseball. He topped the Junior Circuit in ribbies in several seasons. But how many? Depending on where one looks, The Bambino led the American League in RBIs either four or six times. The 2012 edition of The Elias Book of Baseball Records states that Ruth holds the top AL mark in four seasons: 1920 (136 RBIs); 1921 (171); 1923 (131); and 1926 (151). This venerable record book is edited by long-time SABR member Seymour Siwoff, president of the Elias Sports Bureau, the official statisticians for Major League Baseball. Meanwhile, MLB.com, the official website for Major League Baseball, states that Ruth was first in RBIs in six AL seasons: 1919 (114 RBIs); 1920 (137); 1921 (171); 1923 (131); 1926 (146); and 1928 (142). The statistics presented on MLB.com are the responsibility of SABR member Cory Schwartz, Vice-President of MLB.com. Something’s out of whack here: How can such disparate RBI statistics come from two official entities of Major League Baseball? To address this situation I decided to ascertain the accurate RBI record of Babe Ruth for his entire major-league career (1914–35). The results of my comprehensive and in-depth research are provided in this article. Prior to the 1920 season, runs batted in were not an official statistic. However, RBIs were tabulated—unofficially—from 1907 through 1919 by baseball writer Ernie Lanigan, whose career included stints with The Sporting News, New York Press, and Baseball Magazine. After that, runs batted in were recorded on baseball’s official Day-By-Day (DBD) ledgers. During Ruth’s career, the Howe News Bureau was the official statistician for the American League while the Elias Sports Bureau was the official statistician for the National League. Let’s begin with Ruth’s major-league RBI statistics as initially recorded by Lanigan (1914–19), Howe (1920–34), and Elias (1935). 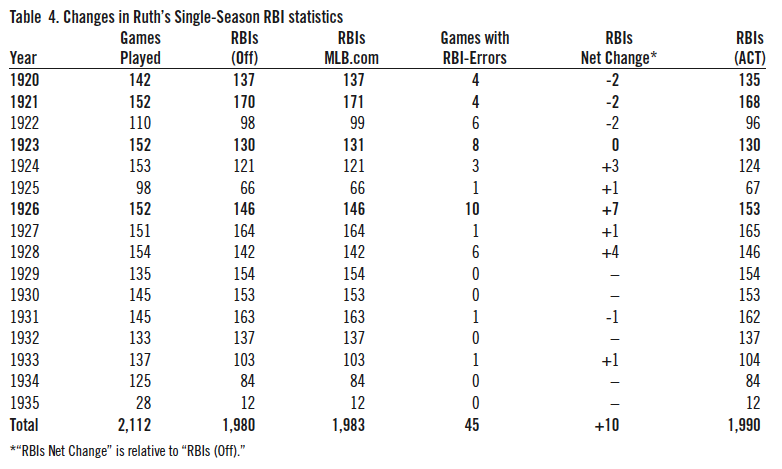 Table 1 contrasts these numbers with the RBI statistics provided on MLB.com, the most-recently published edition of The Baseball Encyclopedia (2008, edited by Gary Gillette and Pete Palmer), the SABR Encyclopedia, and the 2012 edition of The Elias Book of Baseball Records. Table 1 is not as straightforward as it seems. First, Ruth’s RBI statistics from the 1922 and 1926 DBD ledgers are marred with arithmetic errors. Babe Ruth’s official DBD ledger/record for the 1922 season consists of four spread-sheet pages. There is a math error on the second page. Adding up the RBIs for each game (one per line) gives a sum of 24 RBIs. But, the Howe News Bureau in-putter mistakenly came up with a sum of 22, two too few. The math error was carried through on pages three and four, ultimately showing Ruth with the mathematically incorrect total of 96 RBIs for the season, instead of 98. I inserted the mathematically-correct total of 98 in Table 1. This math error went undetected and uncorrected for many years. For example, The Baseball Encyclopedia (aka “Big Mac,” published by Macmillan) showed Ruth with 96 RBIs in both the 1969 and 1974 editions. It was not until the 1976 edition that the sum was updated... to an equally incorrect 99 RBIs (which we will discuss later). Similarly, the New York Yankees Official Media Guide and Record Book stuck with 96 RBIs all the way until 2011, when the total was changed to 99 RBIs. The 1926 error is similar. The official DBD ledger/record for Ruth’s 1926 season consists of six spread-sheet pages, this time with two math errors. The first is on page one. Adding up the RBIs for each game gives a sum of 44, but the in-putter mistakenly came up with a sum of 54. Those extra 10 RBIs carry through all the pages, and then on page two comes the second math error. Adding up the RBIs recorded on the second page gives 29 RBIs, but the in-putter mistakenly summed it as 28. These two combined math errors credited Ruth with nine RBIs more than he achieved according to the records, ultimately showing Ruth with a mathematically-incorrect DBD season total of 155 RBIs, when he should have been credited with 146. Table 1 shows the mathematically-correct total of 146 RBIs. As with the 1922 errors, the incorrect total propagated throughout various publications. Several published by The Sporting News company (The Official Baseball Guide, One For The Book, The Dope Book, and The Complete Baseball Record Book) show Ruth with 155 RBIs in each edition from 1954 through 1974. For the 1975 through the 2004 editions, TSN shows Ruth with 145 RBIs, apparently the consequence of correcting only the math error on page one. Then for the 2005 through the 2008 editions, TSN shows Ruth with 146 RBIs, catching up to the math error on page two. Similarly, The Elias Book of Baseball Records (and its precursor, The Little Red Book of Baseball) shows Ruth with 155 RBIs in each edition from 1932 through 1976. For the 1977 through the 2006 editions Elias also listed Ruth with 145 RBIs, except for the 1996 edition which lists Ruth with 146. The story does not stop there. For the 2007 through 2011 editions Elias lists Ruth with 150 RBIs, except for the 2008 edition which lists Ruth with 149, and the 2012 edition which shows 151. So, Elias alone changed the 1926 total for Ruth seven times. A) The Encyclopedia of Baseball (Turkin and Thompson) lists Ruth as the 1926 AL RBI leader with 155 RBIs in each edition from 1951 through 1976, while for its final two editions (1977 and 1979) Ruth is shown with 145. B) The Baseball Encyclopedia (Macmillan) lists Ruth as the 1926 AL RBI leader with 155 RBIs in its first two editions (1969 and 1974) then switched to 145 for its final eight editions (1976 through 1996). C) The Sports Encyclopedia: Baseball (Neft and Cohen) shows Ruth with 145 RBIs in each edition 1981–94 and with 146 RBIs from 1995–2007. D) Total Baseball (Thorn and Palmer) lists Ruth with 146 RBIs in each of its eight editions (1989 through 2004). E) The ESPN Baseball Encyclopedia (Gillette and Palmer) lists Ruth with 146 RBIs in each of its five editions (2004 through 2008). Curiously, the New York Yankees Official Media Guide and Record Book presents the “mathematically-incorrect 155 RBIs” in each annual edition through 1991. Then from 1992 through 2010 Ruth is listed with 145 RBIs, and in the 2011 and 2012 editions Ruth is listed with 150 RBIs. To my knowledge, no explanations have been given for any of the changes mentioned here. It is no accident that there is complete agreement between MLB.com, the 2008 Baseball Encyclopedia, and the SABR Encyclopedia because Pete Palmer’s database of baseball statistics is employed by all three. Palmer’s statistical database is also used on Baseball-Reference.com and by Retrosheet.org for Ruth’s player profile page (though not Ruth’s daily pages, which are derived from Retrosheet’s independently-generated Play-By-Play accounts). The discrepancies go beyond 1922 and 1926, of course. While MLB.com states that Ruth and Lou Gehrig topped the AL RBI list for the 1928 season (each with 142), The Elias Book of Baseball Records shows Gehrig as the sole leader with 147, five more than MLB.com, the 2008 Baseball Encyclopedia, or the SABR Encyclopedia. Elias has made several changes in Ruth’s RBI statistics for the years he was the AL leader. For 1920, Elias showed 137 RBIs in editions 1932–2007, changing to 136 RBIs starting in 2008. For 1921, Elias moved from 170 RBIs shown through the 1975 edition, to 171. Also changing as of the 1976 edition, Ruth’s 1923 total went from 130 RBIs to 131 RBIs. Apparently, none of these changes were accompanied with explanations or justifications. Perhaps that’s why none of Elias’s changes was adopted by MLB.com, SABR, Baseball-Reference, or others. That was the complicated state of affairs in early 2012 when I commenced my research into Ruth’s RBI statistics. The identity of the player who scored the run. The run-scoring event. Was it a 2-RBI single, a 1-RBI groundout, a 1-RBI grounder (batter safe on a fielding error), a 0-RBI grounder (batter safe on a fielding error), a 1-RBI bases-loaded walk, a 0-RBI balk, et cetera. From 1914 through 1919 The Babe played for the Boston Red Sox. So, for the 1914–19 period of Ruth’s career I relied exclusively on the game accounts and descriptions provided in the three major daily newspapers published in Boston—the Globe, Herald, and Post—and in at least one newspaper from the city of the team that opposed the Red Sox. From these newspaper accounts I assembled a complete game-by-game record for Ruth’s RBI performance. From 1920 through 1934 Ruth played for the New York Yankees, in 1935 for the Boston Braves. In order to achieve my research objective for the 1920–35 period I was aided by the complete (although unproofed) Retrosheet Play-By-Play (PBP) accounts for many of the 2,112 games that Ruth played during the 1920–35 period. For all of the other games I obtained the complete details from the game accounts in several relevant newspapers. During the 1920–35 period, there were 22 games for which I was unable to acquire complete details. (See the Appendix at SABR.org for a list.) With the exception of the game of April 25, 1933 (as well as the two games from 1923 and 1924 for which the newspaper box scores did not include RBI information), the newspaper box scores and the official DBD ledger information for these games agree 100%. From this I conclude it is highly likely the official information is accurate for these games. Regardless, in the absence of detailed R/RBI information for these games, the official DBD RBI information must be considered to be correct by default. Comparison of the unproofed Retrosheet PBP accounts and the various newspaper articles (including box scores) allowed me to identify discrepancies in the RBI statistics given in the official DBD records. I resolved the discrepancies by carefully examining the game descriptions presented in multiple newspaper accounts. I provided those conclusions and the supporting documentation to Retrosheet’s Tom Ruane and Dave Smith for their review of the evidence and their assessments of my conclusions. They concurred 100 percent with my findings and incorporated the relevant information in the Retrosheet boxscore file and the derived player daily file for Ruth. The complete supporting documentation provided to and utilized by Retrosheet for the corrections of the RBI-errors in Ruth’s record is available for public inspection in the online Appendix to this article on SABR.org. I have divided Babe Ruth’s major-league career into two segments, the unofficial RBI period (1914–19) and the official RBI period (1920–35). Ruth’s actual RBI record differs from that presented on MLB.com for each of the six seasons. This means although MLB.com is correct in showing he led the league in RBIs in 1919, he did it with 113, not 114. Moreover, for the 1914–19 period, Ruth amassed a total of 224 RBIs—not 230. Table 3 presents the salient details for each of the 45 RBI-errors I discovered in the official records for Babe Ruth. 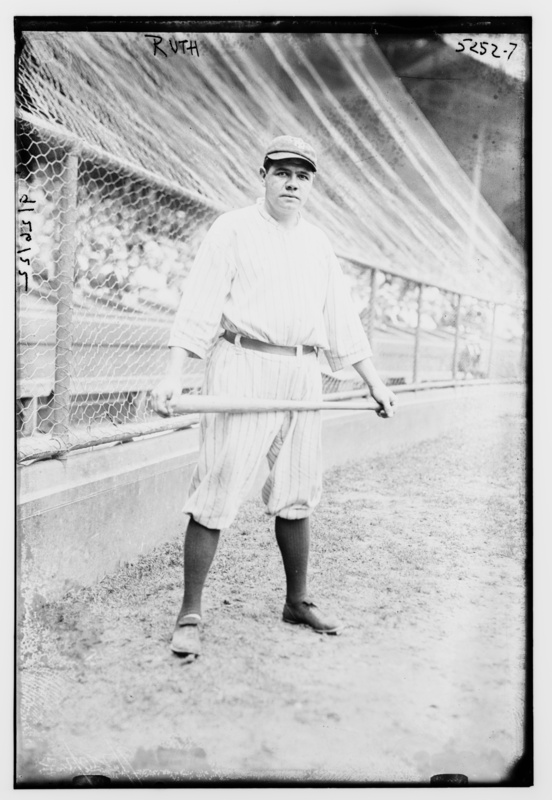 Overall for the 1920–35 period, Babe Ruth batted in a total of 1,990 runs—not 1,983 RBIs as shown on MLB.com—and combining Charts 2 and 4 together his career grand total is 2,214, not 2,213. Table 4 shows that Ruth’s stats as found on MLB.com are wrong for 10 of 16 years in the 1920–35 period and that he topped the AL in RBIs in four seasons (shown in bold): 1920, 1921, 1923, and 1926. The numbers also show that Ruth did not lead the AL in RBIs in 1928. In actuality, Lou Gehrig was the sole AL leader in runs batted in for 1928 with 147 RBIs (not 142 as shown on MLB.com), while Ruth was a close second with 146. Overall for the 1920–1935 period Ruth had 1,990 RBIs (not the 1,983 shown on MLB.com) and for his entire career he collected a grand total of 2,214 RBIs (not the 2,213 shown on MLB.com). At the outset of this article we stated that many baseball record books differ as to whether Ruth led the league in RBIs four or six times. Turns out they’re both wrong: the correct answer is five. The implementation of the corrections. The RBI information for Babe Ruth presented in this article is totally reliable. I obtained complete details for each run scored in 2481 of the 2503 games that The Bambino played. I used independent accounts from several newspapers in order to achieve certainty. I also submitted the documentation to Retrosheet’s Tom Ruane and Dave Smith for their independent review of the evidence. They concurred with my conclusions. (All researchers are encouraged to examine the supporting documentation available in the online appendix at SABR.org.) There were 22 games for which I was unable to obtain complete run and RBI details. As previously mentioned, with the exception of the game of April 25, 1933 and the two games from 1923 and 1924 for which the newspaper box scores did not include RBI information, stats in the newspaper box scores matched identically to those in the official DBD ledgers. This suggests that the run and RBI information in the official records for these games is correct. In the absence of detailed information for these games, the official DBD RBI information must be considered to be correct by default. 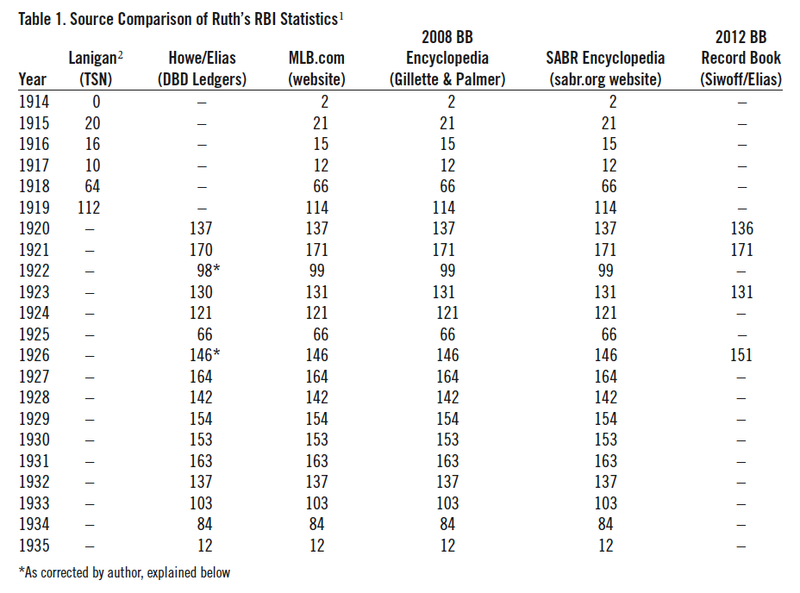 Tables 2 and 4 present the accurate RBI record for Babe Ruth and demonstrate that MLB.com has incorrect information for 16 of Ruth’s 22 major-league seasons, and that many other references and publications are inaccurate, including the 2008 edition of The Baseball Encyclopedia, Baseball-Reference.com, and the SABR Encyclopedia. Ruth’s AL-leading season totals for 1920, 1921, 1923, and 1926 in the 2012 edition of The Elias Book of Baseball Records are also wrong. As noted above, the corrections of each of the 45 RBI-errors have already been implemented on the Retrosheet website. It remains to be seen when Elias, MLB.com, and others might follow suit. To facilitate the implementation of the corrections, I provided the final draft of this manuscript and all the supporting documentation to Seymour Siwoff (Elias), Cory Schwartz (MLB.com), Pete Palmer, and John Thorn (Official Historian of Major League Baseball). Befitting his “most-famous player in baseball history” status, the presentation of Babe Ruth’s RBI record should be accurate. With the results of my research we now know with certainty the accurate RBI record of Babe Ruth. The Bambino led the American League in RBIs in five seasons—1919 (113 RBIs), 1920 (135), 1921 (168), 1923 (130), and 1926 (153). Not only that, The Sultan of Swat holds the distinguished American League record for Most Runs Batted In, Lifetime (1901–present) with 2,202 RBIs. MLB.com and Baseball-Reference.com both show 2,201 at press time. Baseball fans both serious and casual expect baseball’s historical statistics to be accurate—especially for the marquee players, the Hall of Famers, MVPs, and league leaders—and especially for the marquee stats—such as runs batted in. But as the RBI-errors discovered for the Yankees and Tigers of the Ruth-Gehrig-Greenberg era indicate, there probably are a significant number of RBI-errors in the official records for the other major-league teams. Runs batted in is a very important metric in evaluating both the absolute and relative performances of the players on each team and within each league. During the 82 years that the Most Valuable Player Award has been given, the league’s leader in RBIs has earned the MVP honor 55 times (29 times in the AL and 26 times in the NL). It is important to have accurate RBI statistics. At this time—with all the resources currently available—it is both appropriate and feasible to uncover and correct the RBI-errors. SABR’s extensive network of researchers coupled with Retrosheet’s tremendous database of Play-By-Play accounts make achieving accurate RBI counts for all major-league players readily doable. I heartily encourage other SABR members to conduct the requisite research to ascertain accurate RBI statistics for the players on their favorite teams. It is my sincere hope that Major League Baseball will embrace such a collaborative enterprise to correct the errors in the official records and that key officials (and fellow SABR members) such as John Thorn, Cory Schwartz, and Seymour Siwoff will champion the effort. I gratefully thank the following people for their help to me in achieving the correct RBI record for Babe Ruth—Steve Boren, Keith Carlson, Tom Ruane, Dave Smith, Gary Stone, Rich Topp, Dixie Tourangeau, and Walt Wilson. I also wish to express my gratitude to those individuals—the “Retrosheeters”—who volunteer their efforts to create the invaluable PBP database for Retrosheet. HERM KRABBENHOFT, a SABR member since 1981, is a retired research chemist. His baseball research has focused on ultimate grand slam home runs, leadoff batters, triple plays, the uniform numbers of Detroit Tigers, and most recently, consecutive games streaks for scoring runs and batting in runs. 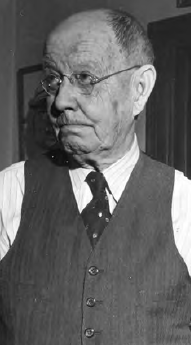 Because of his research on the 1920–1938 Yankees and 1931–1946 Tigers he has accumulated game accounts for all of the other AL teams in their games with the Yankees and Tigers. He welcomes the opportunity to share this information with fellow SABR members as they pursue the corrections of run and RBI errors in the official records of players on their favorite teams. 1. All numbers in this chart, and throughout the article, sourced from websites or online references date from November 8, 2012. 2. J.G.T. Spink, "Daguerreotypes of Great Stars of Baseball ," The Sporting News (1934). 3. Herm Krabbenhoft, “Babe Ruth’s RBI Record with the Boston Red Sox (1914–1919),” Retrosheet.org (Features: Research Papers). 4. 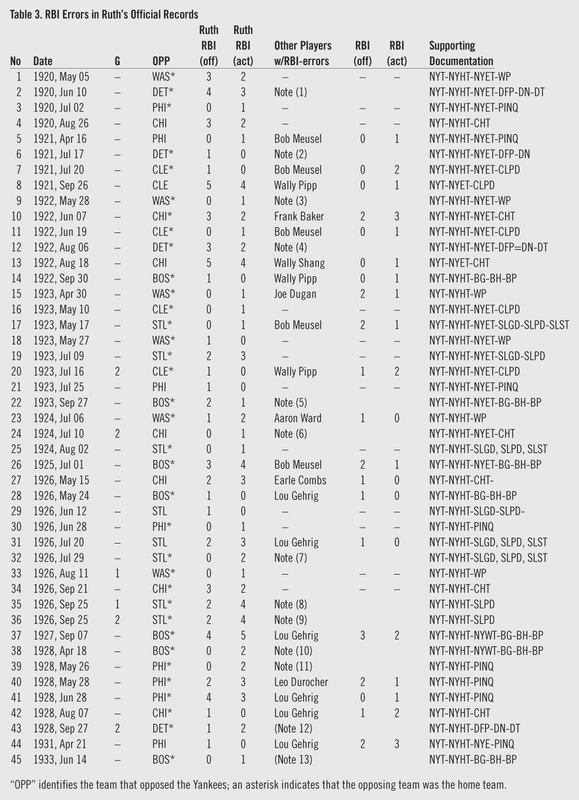 Herm Krabbenhoft, "Babe Ruth 's AL RBI Record," Retrosheet.org (Features: Research Papers). 7. Herm Krabbenhoft, “Lou Gehrig’s RBI Record: 1923–1939,” The Baseball Research Journal (Fall, 2012): 10. 8. Herm Krabbenhoft, “Hank Greenberg’s American League RBI Record,” The Baseball Research Journal (Spring, 2012): 20.